Three rogue casino sites may have been caught red-handed with their hands in the cookie jar, complete with pirated games and at least one fake license. Latest Casino Bonuses (LCB.org) received word from numerous players that something didn’t quite seem right at two relatively new online casinos. The good people at LCB decided to take a closer look and what they found is, sadly, not at all shocking given the internet’s long history of dubious gaming operators. Casino60.com, Casino29.com and CasinoMGA.com are our three prime suspects in a scheme involving fake games and questionable licenses. Players beware: both sites look extremely questionable and should be avoided when there are so many other proven options out there. Even if you have never played at any of these casinos and has no plans to do so, this post makes for an interesting read. And if you follow along, you’ll see how you too can spot pirated games no matter how well-designed they may look. In a post published yesterday detailing its findings, LCB took a close look at Casino60.com in particular and found two major red flags. LBC also noted that Casino29.com appears to be related, and I did some poking around there myself and have come to the same conclusion: both online casinos do not look legitimate. One obvious red flag found at both casinos is they claim to hold a gaming license from Costa Rica. That’s a bit of a problem because Costa Rica is not exactly known as a reputable licensing jurisdiction for online gambling because the country has no regulatory body whatsoever to even oversees gaming sites. All a license from Costa Rica means is someone paid a fee for a “data processing license” at some point in order to run the business out of Costa Rica. Not all sites based out of Costa Rica are automatically scams (some Costa Rican sites do have positive track records), but extra care definitely needs to be taken when a site boasts this license because there is no regulatory oversight. A Costa Rican license is one thing, but that alone would not be enough to warrant the serious accusations levied by LCB. The truly damming evidence has to do with the games themselves that are offered at both online casinos. LCB noted that it has received numerous messages from players who noticed something was off with the games offered at Casino60. The players said the games were “full of glitches” and behaved “very strangely” when compared to those same games offered by other mainstream casino sites. A closer look at the games offered at Casino60 reveals they are most likely pirated games, not authorized by the gaming companies whose logos adorn those games. Before we dig into the nuts and bolts of this, let’s take a step back and consider how software providers such as NetEnt protect the integrity of the games they release. Casino game providers such as NetEnt build online slots from scratch and then lease those games only to specifically-authorized casino sites and select gaming platforms. Casino software providers have an incentive (and usually a legal obligation) to ensure their games run properly, are truly random and so on. Otherwise, they would lose the trust of players and suffer a serious image problem. One of the key points to ensuring the integrity of games developed by well-known developers such as NetEnt is to ensure their games cannot be altered so as to change payout rates or the odds of winning. This can be accomplished by the casino software developer hosting the games on its own servers and then allowing gambling sites to access those games, as opposed to simply giving the casino the source code of the software (which could then be manipulated by the casino). 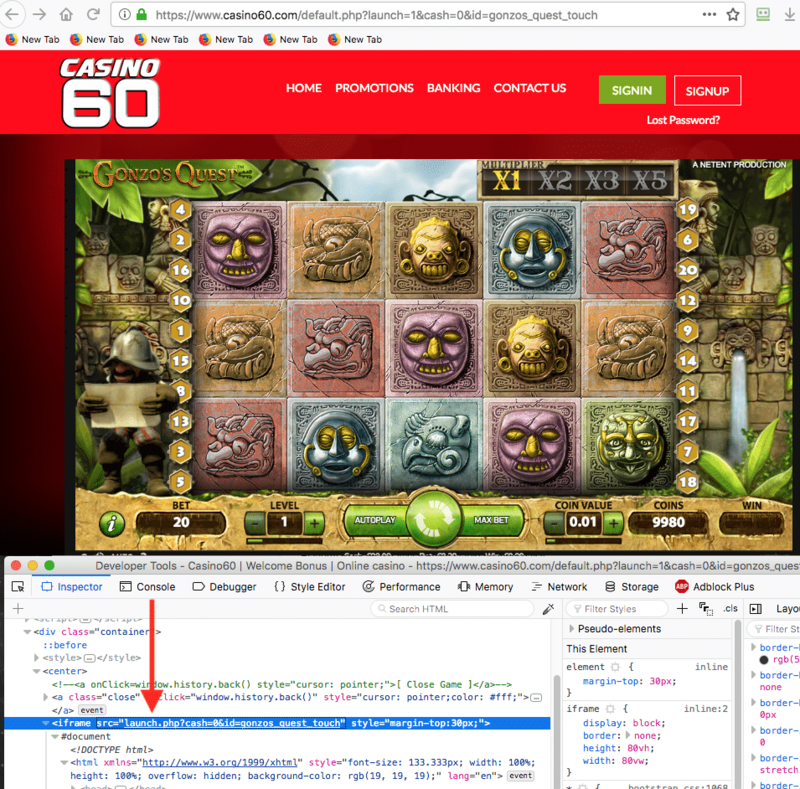 For example, if you visit a trusted online casino such as Unibet Casino, access a NetEnt game and then use your browser’s built-in inspector tool (right click -> inspect element on Firefox) to see where that game is hosted, you’ll see that the source location of the game is casinomodule.com, which is a well-known server used by NetEnt to deliver games to customers’ computers. Note that NetEnt does not allow its clients to host its games on their own servers! NetEnt hosts all games on its own, specially-designated servers. Any online casino hosting NetEnt games on its own internal servers is running pirated games. 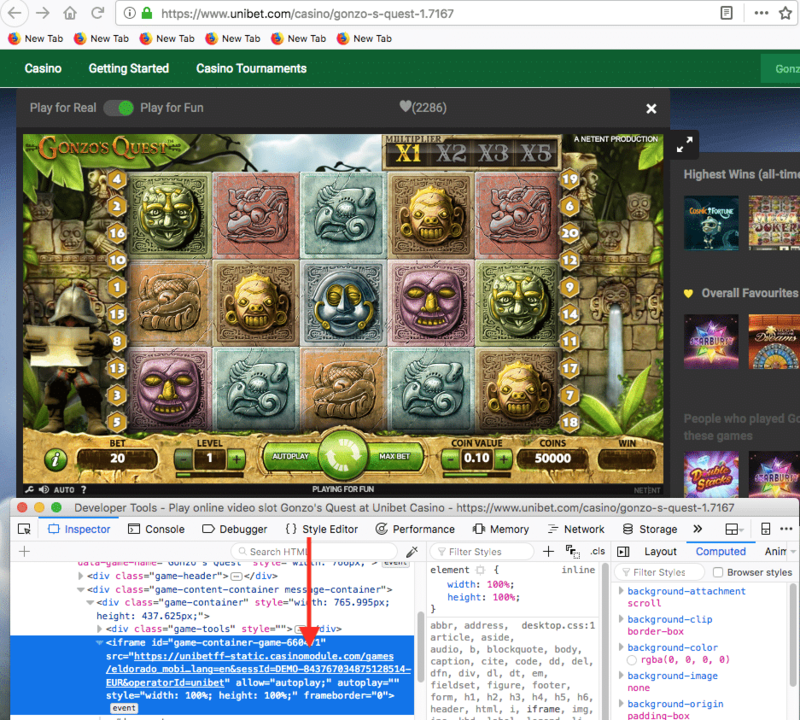 The screenshot below is from Unibet Casino and you can see the source code shows the game is hosted at casinomodule.com. That means everything is working as it should – this game is legit as we would expect from Unibet. And now, let’s take a look at that same game offered at Casino60.com. Below, we can see the source address of the same game. Rather than being hosted at casinomodule.com as it should be, the following game is self-hosted on the Casino60 website. I ran the same test at Casino29.com and found the same result: self-hosted games. To summarize: casino games from trusted software providers should not be hosted internally by individual online casinos. The software provider must host the games on its own servers to retain control over its own games. Otherwise, the games can be altered by unscrupulous casino sites. In a separate post published yesterday, LCB shed the light on yet another rogue casino that should be avoided by all players. In this casino, we have CasinoMGA.com. From the very beginning, there were issues with this casino starting with the name. The inclusion of the letters “MGA” almost make it seem as though this casino is trying to pass itself off as something authorized by the well-known Malta Gaming Authority licensing jurisdiction. Whether that was their intention or not, this is a minor issue compared to what else CasinoMGA.com has been up to. LCB caught CasinoMGA.com red-handed trying to pass itself off as licensing by Curacao eGaming. Up until recently, Casino MGA had a logo of the Curacao eGaming authority. LCB discovered that not only is Casino MGA definitely not licensed by Curacao, but the license it did have posted on its website was actually for a totally different online casino. Sometime between yesterday’s LCB investigation and this post today, Casino MGA has removed the Curacao eGaming logo from its website. It seems CasinoMGA.com knows it has been caught red-handed and is now working to hide the evidence. We won’t go through the whole process all over again, but LCB ran the same tests for pirated games at CasinoMGA.com and found compelling evidence that CasinoMGA is also running pirated games from a number of mainstream software developers. These games look and function almost exactly like the real thing. Some eagle-eyed players noticed minor oddities with the pirated games, but a typical recreational player would have a very difficult time noticing anything was wrong with these games. The CasinoMGA games may look and feel very real, but they are hosted on their own servers. That means the casino itself can adjust the game in any way it wishes without the authorization of NetEnt. And let me tell you this – CasinoMGA doesn’t go through all the trouble of pirating games so it can increase your odds of winning. One other thing LCB found that’s worth noting is that some of the fake NetEnt games found at CasinoMGA.com are hosted on servers purposely named to look like the real thing. For example, LBC found a pirated version of Starburst hosted at casinomodules.com. The problem is that extra “s” at the end should not be there – the official NetEnt games server is casinomodule.com. It pays to do your homework. We always recommend players stick with our trusted casino recommendations, but we also know that sometimes you just want something totally different or need a new bonus, which means sometimes expanding out to newer casino sites that are not as well-known. Whatever the case, it’s always a good idea to do a little research. Running the names of any of the casinos discussed today would have yielded few search results from reputable casino information websites. That would be a red flag that should prompt further research. Doing so will open a window in which you see all sorts of code. It looks like a big mess, but all you’re looking for is a source for the game as we did in the screenshots above. Once you’ve found where the game is hosted, you can run a search online to see if that’s the official server for that particular game. And last but not least – if you can’t tell if a casino is safe and you can’t find information online, it is better to play it safe and move on to the next casino site. There are thousands of other online casinos that would be more than happy to have your business.